Hello Everyone! Today I will be showing you how to repair BumGenius pocket diapers. My friend sent me a dozen diapers that her son wore through potty training and she wants to use for her daughter now. Obviously after 2 years of use the elastic isn't so stretchy and the aplix isn't so sticky. But BumGenius sells these little refresher kits with new aplix and elastic for its users to repair their own diapers. They are only $1 so unless you already have the elastic and aplix on hand you may as well just buy the kit and save the time... you really wont save much money by buying a whole roll of elastic and aplix. These kits come with 3 pieces of elastic (2 leg gussets, 1 for the back they are all the same length about 4.5in) 2 hook tabs, 2 loop tabs, 2 laundry tabs and instructions. These kits DO NOT come with new aplix for the front of the diaper so if your diaper needs that, these kits wont have everything you need. First remove all the aplix that you will be replacing, using your seam ripper... taking care that you do not rip the PUL or suede cloth. Then you can open the inner seams to get to the elastic. new elastic on top, old stretched out elastic on the bottom stretched out elastic will allow for leaking of your diapers, hence why we replace the elastic! The hardest part of these repairs is replacing the elastic but I assure you there is an easy way! After fiddling with wire hangers, safety pins, chopsticks and anything I could get my hands on I found a better way! The directions that come with the kits say to use a safety pin for guiding the new elastic through the elastic channel but 1. this is a huge pain and 2. you could damage the PUL this way. After pinning the new elastic to the seam allowance where the old elastic is I stitched the other end of the new elastic to the old elastic using embroidery floss. Nothing fancy here, just a simple double knot to secure the new elastic to the old elastic. 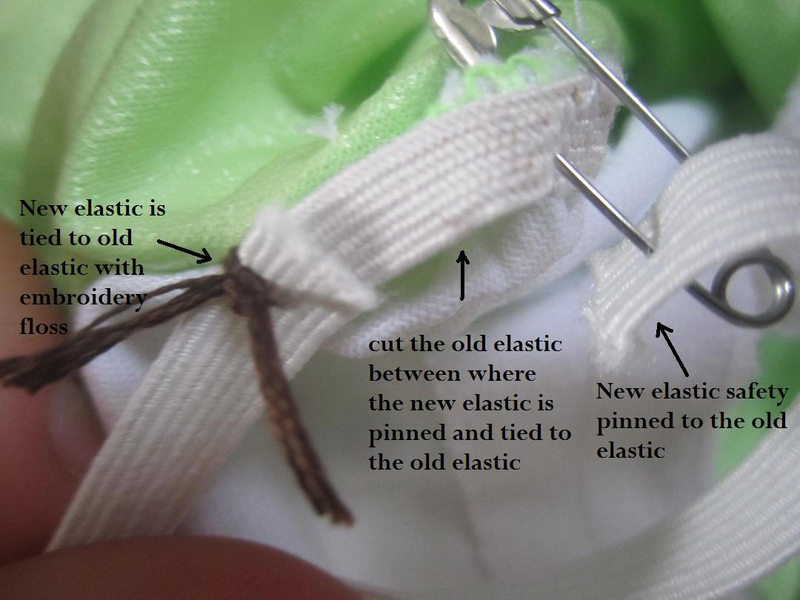 After you cut the old elastic you can go to the other side of the elastic channel and pull it through! After you pull the elastic through to the other side and pin it, you are ready to sew! You can replace the safety pin with a straight pin or you can just hold it securely in your hand. I usually just hold it tightly as I sew. Keep in mind you are only sewing the elastic to the seam allowance, not to the PUL or suede cloth. After you sew both ends of elastic to the seam allowance you can flip the diaper and close the seam allowance seam (what you opened with the seam ripper when you exposed the elastic)by just stitching over the old seam of the leg gusset. After all the elastic is in (hard part done!) you can sew on the new aplix. This is really simple to do, not much explanation here. Keep in mind the hook part of the hook and loop should be facing inward, loop faces outward. The directions on the refresher kit say to leave the old laundry tab on and sew the new one over it﻿. The new laundry tabs are a bit bigger than the old ones so this is easy to do but if you want to you can remove the old ones anyway... it doesn't matter. Make sure you go over all these seams at least twice. Once the new hook and loop and elastic is on, you are done! Tada!! For only $1 and maybe 20 minutes (less time once you do it a few times and get in the groove) you have a nice fresh diaper! Here's a picture of a refreshed diaper and a not refreshed. The refreshed diaper is on the left. I hope reading and watching helped you in some way. Cloth diapers are an investment! We dont spend $20 a diaper to throw them away 2 years later! They really are not hard to repair and refresh. I will be repairing my Flip diaper covers in a couple days so I will blog that also for those of you with Flips! Wow. Ok I'm blonde. My BGOS elastics have been heading south, but I've been putting it off because all this time I was thinking I'd need to cut open the diaper. The pocket. Duh. Flip it inside out. You're pretty much a genius. So now when my son grows out of them and the new baby's legs are too small I can do this. Huzzuh. Wow easy peasy! Thanks for this excellent tutorial. I have a dozen hand me down BGs that need to be refreshed and like Susy was thinking it was going to take a whole lot more work. I'm excited to finally have a stash of pockets! Are you interested in getting paid to refresh about 20 BGOS 3.0 AIOs? I'd send them with repair kits, and pay you however you want (check, PayPal) for repair work plus return shipping. Having a hard time finding someone locally to do it and our hands are full with the new baby and our 3 year old "spirited" boy. Have you done any front strip replacements? I've done all of my tabs and now noticed the front strip is going south. The company sent me directions on how to replace it BUT it converts the diapers to all-in-one's rather than pockets (arghhhh!). I'm not a sewing expert, but am willing to try if someone had some sort of instructions on how to replace the front. Thanks! Thank you so much for this tutorial.I did 13 dipes yesterday and have 9 more to do today. I have a few suggestions to make this go even faster. First, just sew down the first side of the elastic to the seem allowance rather than pinning it. Sew it down and you're done with that step. Then instead of tying the other end of the new elastic to old with embroidery floss, pin it with a super tiny safety pin. I know you discuss using a safety pin, but I think you must have been using a slightly larger one. The one I have just glides right through the channel and I don't have to waste time tying and cutting floss. It's all still a very tedious process, but these 2 things made a huge difference in the time I spent on each dipe. Another cool thing I learned along the way is that BG 4.0s were designed slightly differently than 3.0s in that the ends of all the elastic were left accessible! You don't even have to rip the seems! I really hope that replacing all this elastic helps with the leaks we've been having lately. Moth of the dipes we have were bought EUC from a swap, used with my son until he learned to use the toilet around 2.5 years, and have been used with my daughter for the past 2 years! Even putting these two days into replacing elastic, and converting them all to snaps a few years ago, cloth has definitely been worth the initial expense. Thanks for helping me keep my old dipes young! 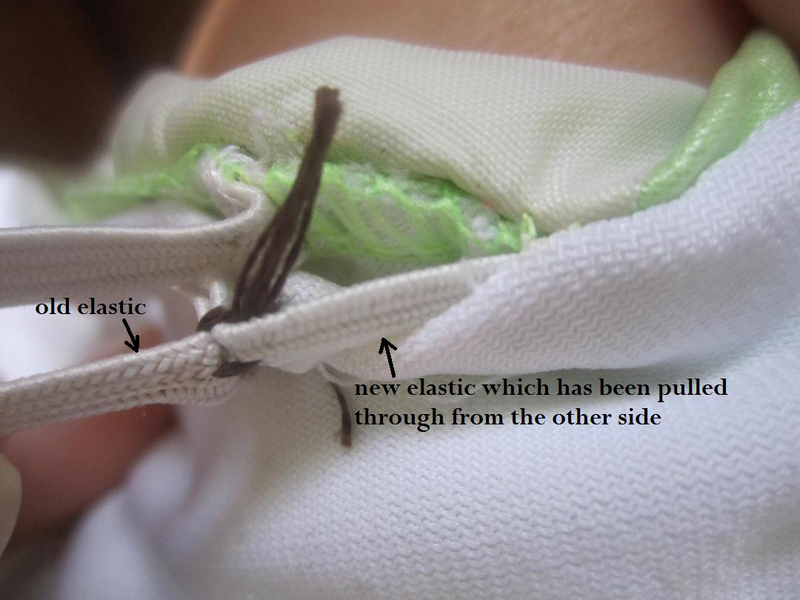 Just a heads up- You should probably buy your own good quality elastic; the product BG uses is notoriously crappy(the same stuff that failed in the original diaper) and you'll just have to replace them again, whereas, good quality kind you find in a craft store should last you through multiple children without having to be replaced. Have you replaced elastic in flip covers and econobumm covers. If so I was just wondering how hard it is. yes, it is basically the same procedure.